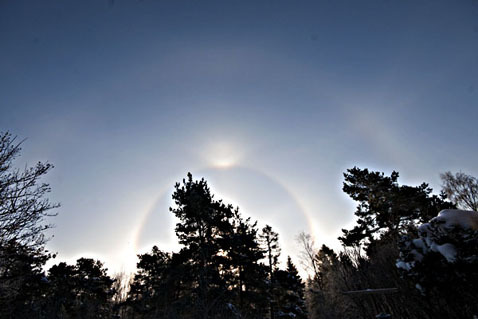 The halo was observed in Brandbergen 20 km south of Stockholm Sweden. Time for the display was 1-dec-10 9:50 - 10:50 AM. There were snow guns running at two ski-slopes both of them 20 km away. I don’t know if they had some influence. More images can be seen if you click on the image above. Thats a nice halo complex you got. The snow cannons yes they DO have en effect and played a role in generating the halos. The water thats expelled from the snow cannons has some kind of a condensation nuclei in it so when it hits the air and freezes it forms optically perfect crystals neccessary for the halos. If you don't have one Matts get you a 10 Million candle power spotlight and go out on a night into the crystal swarm turn it on, get about 300 foot away and enjoy the show. This is good display. Especially the stage with strong belic arc caught my attention. We have seen such displays with strong Tape arcs but practically no 46 infra in spotlight and I have been wondering who not in sunlight. Well, now we have one.